Homemade Fruit and Vegetable Juice Ice Pops! These healthy fruit and veggie popsicles are fun to make and eat. 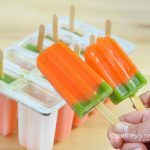 Pour carrot juice into popsicle mold and place in the sticks. Freeze ice pops for another 2 hours and then enjoy! Nutrition will vary depending on juices used.